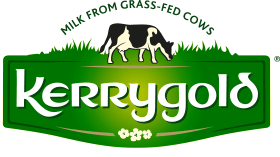 Place a saucepan over a medium heat and add the two tablespoons of Kerrygold butter. Then stir in the onion, garlic, potato and season with sea salt and freshly ground black pepper. Cover and stir occasionally until the onion is tender about five minutes. Remove the lid and stir in the cauliflower and stock, simmer over a medium-high heat until the potato and cauliflower are very tender, about 20 minutes. Next purée the soup until you reach a smooth consistency. Place back over the heat and stir in the Dubliner cheese, milk and season with sea salt and freshly ground black pepper. Meanwhile make the Dubliner cheese croutons. Mix the Dubliner cheese, Dijon mustard and melted Kerrygold butter together in a bowl. Spoon the mixture evenly between the four half slices of sourdough bread, and place in the pre-heated oven for five minutes. 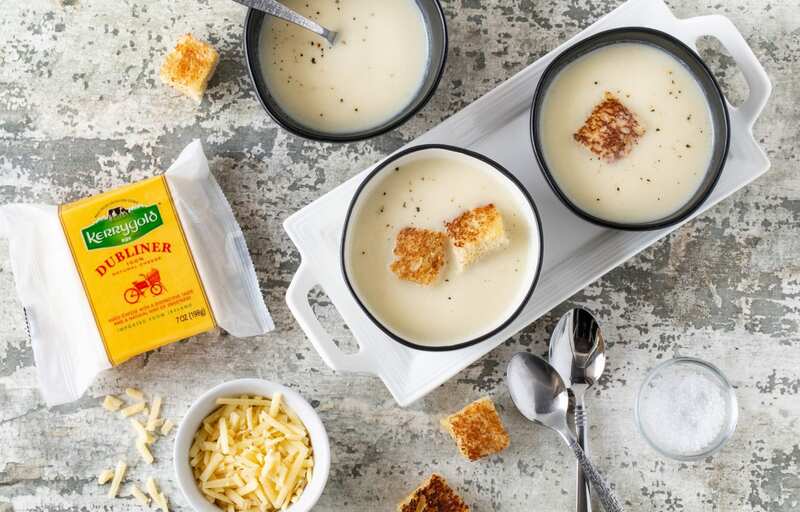 To serve, spoon the cauliflower soup into four warmed bowls and place a Dubliner cheese crouton on top of each soup.